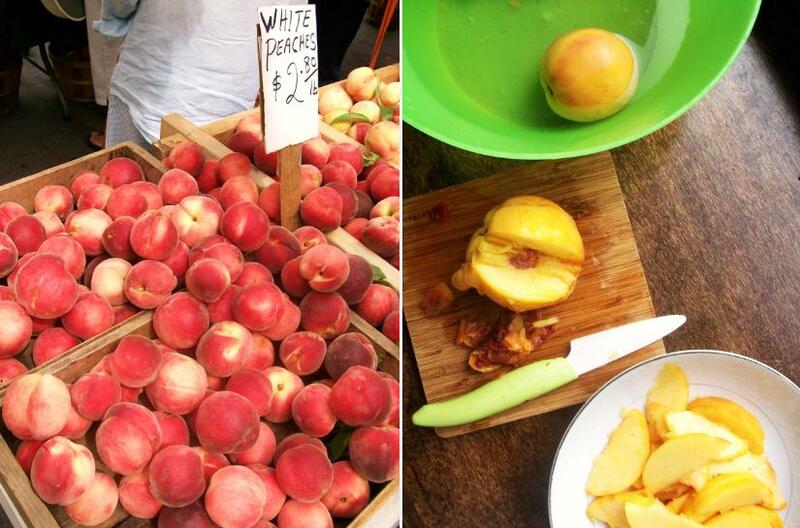 For the James family, canning peaches was one way to keep that taste of summer all year round. Add a little brandy to the syrup before canning them, and you have an extra-special treat; spooned over ice cream, they were James’ favorite dessert. “If they were rather a ‘party dish’ it was because they made the party whenever they appeared, and when ice-cream was added … they formed the highest revel we knew,” he wrote. If you’d like to can your own peaches, you can get tips from The American Housewife (1878) and Amanda Hesser. But for those of us too impatient to wait until winter, this shortcut version has all the booziness and none of the botulism. When the teenage James was in school in Geneva, he complained to a friend about the inadequate size of the scoops, only “twice as large as a peach pit! Be thankful you are born in our free and enlightened country.” So be generous with the ice cream. It’s the American way. 1. In a small saucepan over medium heat, add milk and sugar and stir until sugar is dissolved. Scrape seeds from vanilla bean into milk with a paring knife, then add bean pod to milk. Cover, remove from heat, and let sit 1 hour. 2. Set up an ice bath by placing a 2-quart bowl in a larger bowl partially filled with ice and water. Pour cream into 2-quart bowl. 3. In a separate small bowl, whisk egg yolks. Rewarm milk mixture over low heat. Add egg yolks, stirring constantly, until the mixture forms a custard thick enough to coat the spatula. 4. Strain custard into cream, removing vanilla bean pod, and stir mixture over the ice bath until cool. Refrigerate to chill thoroughly, preferably overnight. Freeze custard in your ice cream maker according to the manufacturer’s instructions. 1. Peel peaches: Prepare a large bowl of ice water and set aside. Bring another large pot of water to a boil. Cut a shallow “X” in the bottom of each peach and submerge in boiling water 1 minute. Remove peaches and plunge into ice water bath. Peel off peach skins and cut flesh into 1/4-inch slices. 2. In a medium saucepan, combine peaches, brown sugar, and lemon juice. Cook over medium heat, stirring frequently, until peaches are soft enough to cut through with a spoon, about 5 minutes. Remove from heat and add brandy, stirring to combine. Serve warm over ice cream. 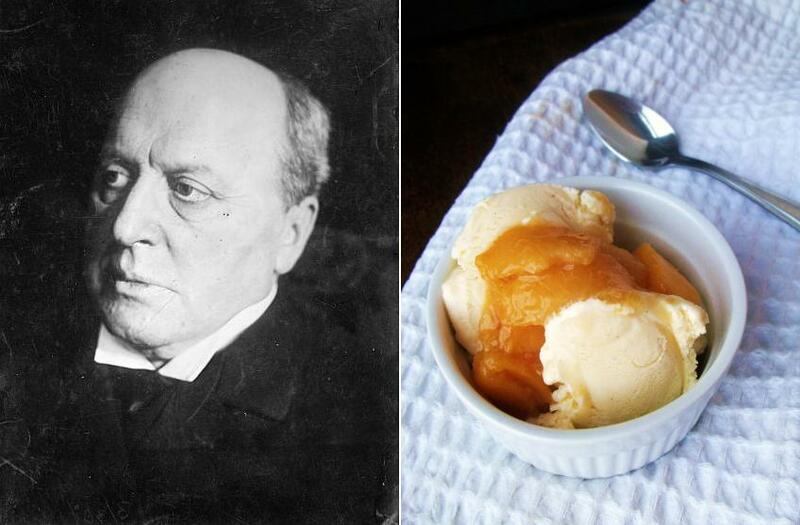 Thanks for the fabulous post — Love Henry James and peaches! Thanks, Jama! I love them individually, too – and they make a winning combination! This is very much like Yummy Books which is a very original site with really good recipes, I have been following for over 2 years. Check it out! I love Yummy Books, too! I found Cara earlier this year, after another reader pointed me to it. And if you like it, you might also like Paper/Plates (www.paperplatesblog.com) and Eat This Poem (www.eatthispoem.com). All wonderful sites for lovers of food and lit, with different twists. Happy reading! Hooray for food and literature nerds! What a fascinating blog. I agree with yummybooks–hooray for food and literature nerds. I enjoyed reading your post and I am glad I found your blog. While my blog is not devoted to food and lit, I have been hosting an event that focuses on it, called Novel Food http://briciole.typepad.com/blog/the-novel-food-collection.html Food references in literature and food inspired by literature are themes close to my heart and I like finding kindred spirits. As for Henry James, in the current New Yorker, there is an interesting review of a book on Portrait of a Lady.